Say good-bye to the $10 hotel-room Diet Coke. Hotel minibars are falling out of favor with travelers and hotels. Mini-bar sales dropped a stunning 28 percent from 2007 to 2012, according to a study from PKF Hospitality Research, which collects data from thousands of U.S. hotels. To save money, hotel chains such as Grand Hyatt, Hilton and Marriott are phasing out the feature, either paring down offerings or emptying the refrigerators so guests can fill them with their own food and drinks. Travelers these days buy their snacks in nearby convenience stores or in new snack shops that hotels are increasingly building in their lobbies. Hotel guests' penchant for private in-room boozing is also on the decline, thanks to the rising popularity of the lobby bar. 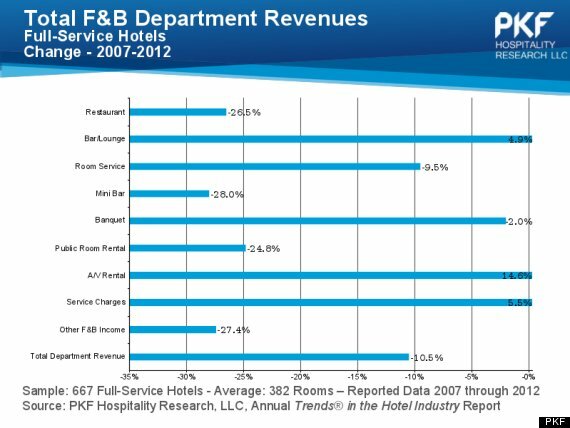 Hotel bars and lounges saw a 4.9 percent jump in revenue from 2007 - 2012, according to PKF's research. “There’s this generational desire to be in the lobby, gathered in a public place, drinking my wine and taking advantage of the Internet,” said Robert Mandelbaum, director of research information services at PKF. The decline of the minibar may be a welcome change. Minibars were ranked as the least important hotel amenity, in a recent survey released by TripAdvisor. Today's traveler much prefers to have in-room WiFi. The growing popularity of corner stores like 7-Eleven, Wawa and CVS Caremark makes it easy for guests to walk a block or two from their hotel rooms to buy the same beverages and snacks at a far lower price than in minibars. The number of convenience stores increased to a record 149,220 in 2012, a 0.7 percent increase from the previous year, according to the Association for Convenience & Fuel Retailing. In response, many hotels are launching grab-and-go markets in their lobbies, featuring prepared food and lower prices, Woodworth said.